Labradors originated in Newfoundland, off the coast of Canada, and were taken to England on fishing boats in the early 19th century. Here they were developed and bred as a hunting dog, being used for retrieving game in rugged terrain and icy waters. They were popular as tough, strong dogs with excellent scenting powers and a desire to please. Labradors live from between 12 to 15 years of age. Labrador Retrievers are intelligent, active, fun-loving dogs, eager to please and extremely sociable. They want to be everybody's friend and are not a one-man dog. The breed is wonderful with children and so makes a good watchdog – letting out a big, deep bark to notify of any intruders. 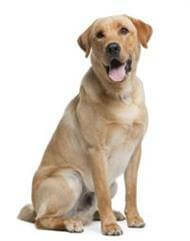 Labradors need a large, draught-proof kennel, raised several centimetres off the ground. In summer they require plenty of shade. Similar to all dogs, Labradors are happiest if kept fit. Adults will benefit from a daily walk of 30 minutes, while pups will need overall periods of play. As a Labrador will need some running, a large back yard is desirable. As they can also be great diggers and chewers as puppies, it is a good idea to fence an area for the dog if you are attached to your garden. Labradors have a tendency to put on weight, that can cause health problems, so their diet needs to be carefully restricted as they mature. Obesity can predispose them to diabetes, heart disease and arthritis. Conscientious breeders have their dogs X-rayed for hip dysplasia and osteochondrosis, and have their dog's eyes tested annually by a veterinary ophthalmologist to detect any disease at the earliest stages, and do not breed from affected animals. Labradors can be exuberant and boisterous as puppies, so it may be difficult for either the very young or elderly family members to control them at this age. A well-fenced yard is also a must to protect this animal. Find out about important information about purchasing dogs from pet shops and traders.